Since the turn of the millenium, I've been advancing what I've called the DHA-Accelerated Aging Hypothesis (AKA Michael Rae's Fish oil-Accelerated Aging hypothesis (MiRFAA), an acronym coined by the sorely-missed Michael Sherman to refer to an hypothesis built up from an inference he himself had made from a passing reference in Dr. Aubrey' de Grey's The Mitochondrial Free Radical Theory of Aging). It posits that people on CR should avoid intake of long-chain polyunsaturated fatty acids (LCPUFA), AKA highly-unsaturated fatty acids (HUFA), and especially omega-3 HUFA (DHA and EPA, most often found in fatty fish and fish oil), and especially-especially DHA. This is based on a range of empirical observations which are reviewed at the bottom of this post, and also in the introduction to material recently posted by Al Pater (see also (2) below, although it is from 2007 and comes at the subject from a different theoretical POV than I favor). Instead, one should maximize one's intake of fat from healthy, plant-based monounsaturated fats (and, in particular, high-phenolic, high-oleic extra-virgin olive oil), minimize or eliminate omega-3 HUFA, and get one's essential fatty acids (omega-6 and omega-3) from short-chain sources such as flax oil. However, all the data has been either correlative, or to the extent that it has been experimental, it has been studies of the effects of different interventions on mitochondrial (and, less importantly, tissue) membrane composition. There have been no direct tests of the question: will minimizing the intake of omega-3 HUFA further optimize lifespan in CR experimental animals — and thus, potentially, humans? Weekly body weights for the mice in the four diet groups are shown in Figure 1. Regardless of the dietary fat source, 40% CR significantly decreased maximum and mean body weight (p < .001) when compared to the Control mice (Table 2). However, there were no differences in mean or maximum body weights between the three 40% CR groups (Table 2). Life span was increased (p < .05) in all CR groups compared to the Control mice. 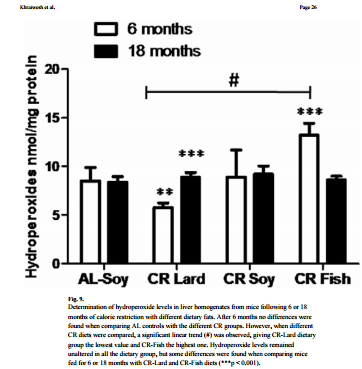 Life span was also increased (p < .05) in the CR lard mice compared to animals consuming either the CR fish or soybean oil diets. Note: *Survival times (days) with approximate 95% confidence interval indicated in parenthesis. Now, before everyone goes out and stocks up on lard (or even coconut oil), let me give three reasons to focus on monounsaturated fats (and, in particular, high-phenolic, high-oleic extra-virgin olive oil) and avoid saturated, despite my advocacy of the "DHA-Accelerated Aging Hypothesis" and the particular use of lard in (1). (This figure is from (2) below, which is also a good review of the underlying correlational data underlying MiRFAA, although it has a different theoretical explanation for the phenomenon than I or Gustav Barja). But then those with two double bonds are twice as oxidizable as either MUFA or SaFA, those with three doube bonds are twice as oxidisable as those with two, those with four are four times as oxidisable as those with two, and so on. α-linolenic acid (ALA = 18:3 n-3) has THREE double bonds; DHA (22:6 n-3) has SIX. Second, there is the structure of biological membrane phospholipids. The phospholipid structure of the membrane of a cell of a given type is dictated by the functions needed by that cell, so that one cell will have more "phosphatidylcholine" and anther more "phosphatidylethanolamine" and a third more "phosphatidylserine" etc (tho' in fact even these names are rough & ready, and each includes several subspecies). In turn, the internal fatty acid structure of those PL are themselves to an extent determined by their nature. Nearly all PL have to have a saturated fatty acid in their sn-1 position, and nearly all have to have an unsaturated FA in sn-2. In some cases, the particular PL needs a very specific UFA indeed, which is why neither CR nor altering the diet has very much influence on the membrane FA composition of the brain or the retina; but others are much less specific, and any ol' UFA (or a range of UFA) will do. What you are doing by altering your diet, then, is shifting the specific UFA that occupies the sn-2 position of your membrane PL. Even if you WANTED more SaFA in your cell membranes (which, for reasons given above, actually would be of no benefit), eating more SaFA will not get you there. (It may, however, be worth noting that high SaFA intake may have an indirect effect that is beneficial on this narrow question of tissue membrane PL unsaturatioin index if you're also consuming a lot of PUFA, because high SaFA intake increases the activity of delta-9 desaturase, which converts some of the SaFA to MUFA (especially, stearic (18:0) [thanks Brian!] to oleic (18:1)). So a high-SaFA diet can (inefficiently) increase the availability of oleic to compete with PUFA at the sn-2 position, even tho' it has no effect on the am't of SaFA in the tissue membranes. You can see this for animals fed lard in several previous studies linked in my appendix below. But consuming more MUFA directly while limiting PUFA is a more efficient way of doing this). And, finally: remember, while I advocate for this "DHA-accelerated aging hypothesis," it remains an untested one in an experimental sense -- and even I think that its effects will be felt on the margin of things, and only in people on CR. By contrast, the epidemiology and clinical trials are pretty clear that SaFA will kill you dead of a heart attack or occlusive stroke, irrespective of whether you're aging a little slower because of an altered cell membrane composition. Personally, I get all the n3 (5 g ALA) & n6 (12 g LA) I think necessary, and it's all from a small am't (2 tsp) of flax oil and very high-oleic, low-n6 fats (high-oleic, high-polyphenol, premium VF EVOO, plus hazelnuts and a bit of avocado); I certainly wouldn't be using conventional safflower oil, and already choose for other reasons not to consume soybeans. 1.Across species, double bond content in the mt inner membrane (MIM) -- and esp DHA content -- is inversely correlated with max LS. 2. Within a species, double bond content in MIM increases with aging. 3. CR, the most robust and well-studied anti-aging therapy per se (therapies that extend max LS in healthy mammals), retards (2). (Some examples are present in the first post under point (2), above: refs. (1) and (3)). 4. Feeding all animals yet tested longer-chain PUFA, such as DHA, increases DHA content in MIM. 5. Specifically, in rodents, feeding fish oil both increases MIM DHA content, AND increases the actual peroxidation of the MIM. 6. CR opposes the incorporation of dietary EPA/DHA into MIM. (To understand how these abstracts show this, NB that CL=cardiolipin (diphosphatidylglycerol), a phospholipid only found exclusively (or, some would claim, just OVERWHELMINGLY) in MIM), & MIM contain PL exclusively (no TGs). Important updates on the effects of feeding different fatty acids on tissue membrane fatty acids are here. 8. DC, Ma, and Id mouse lines (wild-derived mice with significantly greater lifespans than laboratory strains) also exhibit low membrane peroxidation index. Hulbert AJ, Faulks SC, Harper JM, Miller RA, Buffenstein R. Extended longevity of wild-derived mice is associated with peroxidation-resistant membranes. Mech Ageing Dev. 2006 Aug;127(8):653-7. Epub 2006 Apr 18. PubMed PMID: 16620917; PubMed Central PMCID: PMC2929641. Inductive conclusion, from the above & a few other tidbits: eating DHA will lead to more DHA in MIM and tissue membranes; more DHA in MIM and tissue plasma membranes correlates with aging within and across species, and is actively opposed by normal organisms -- an effect upregulated in CR. Eating DHA causes effects which parallel the 'normal' aging process and which oppose known effects of CR, the only proven anti-aging intervention in mammals. 1. The Influence of Dietary Fat Source on Life Span in Calorie Restricted Mice. López-Domínguez JA, Ramsey JJ, Tran D, Imai DM, Koehne A, Laing ST, Griffey SM, Kim K, Taylor SL, Hagopian K, Villalba JM, López-Lluch G, Navas P, McDonald RB. 2. Life and death: metabolic rate, membrane composition, and life span of animals. Hulbert AJ, Pamplona R, Buffenstein R, Buttemer WA. Physiol Rev. 2007 Oct;87(4):1175-213. Review. Skeletal muscle data combined from Valencak and Ruf (2007) and those cited in Hulbert (2005); liver mitochondrial data combined from Pamplona et al. (1998) and those cited in Hulbert (2005). Data for naked mole-rat from Hulbert et al. (2006b); echidna from A. Hulbert (1) Whole figure from (2). Measurement of the fatty acid composition of human erythrocyte membrane lipids, as well as in vitro measurements on erythrocytes, has shown that centenarians have a reduced susceptibility to peroxidative membrane damage (Rabini et al. 2002). Part of longevity variation is genetic in origin. Studies of Danish twins suggests the heritability of longevity is 0.23 for females and 0.26 for males (Herskind et al. 1996); hence children of centenarians have been used as a model system for the study of the genetic basis of human aging (e.g. Atzmon et al. 2006). The fatty acid profile of erythrocyte membranes has been proposed as a potential biomarker of human longevity. A recent Italian study reported that the children of nonagenarians had erythrocyte membrane lipids with a PI of 64 (Fig. 6), which was significantly lower both than the value of 85 measured for a group of matched controls and the value of 83 for unmatched controls (Puca et al. 2008). (And note that erythrocytes are actually the weakest case to look at, based on the animal evidence: you would expect a stronger link in postmitotic tissues like skeletal muscle). 1: Hulbert AJ. Explaining longevity of different animals: is membrane fatty acid composition the missing link? Age (Dordr). 2008 Sep;30(2-3):89-97. doi: 10.1007/s11357-008-9055-2. Epub 2008 May 31. PubMed PMID: 19424859; PubMed Central PMCID: PMC2527634. 2: Hulbert AJ, Beard LA, Grigg GC. The exceptional longevity of an egg-laying mammal, the short-beaked echidna (Tachyglossus aculeatus) is associated with peroxidation-resistant membrane composition. Exp Gerontol. 2008 Aug;43(8):729-33. doi: 10.1016/j.exger.2008.05.015. Epub 2008 Jun 11. PubMed PMID: 18586080. Michael, are you suggesting that ad-lib eating humans, unlike CR practitioners, would not (potentially) benefit from avoiding HUFA? If so, why would/could this be the case? @Guest_Bruce_: first, please do me and you and everyone on the Forum a favor: register on the Forums and log in each time before you post! It's fine if you want to use a pseudonym, but registering and logging in will ensure that you can't be impersonated and will make it easier to keep track of your questions, input, and progress. As to your Q: a few things. First, I really only expect the effect of these changes (trading dietary HUFA for short-chain EFAs per se, and keeping total n6 and n3 EFAs down to levels minimal-but-sufficient for long-term health in conventional terms) to have a very small effect on the underlying rate of aging. If you're eating AL (even reasonably healthily) and don't have a job that gives you regular aerobic exercise throughout the day and at low risk of injury, there are so many other things in your diet, lifestyle, and environment that play a much greater role in your life- and health expectancy than a small difference in the rate of aging that it's likely way down on your priority list. Relatedly, the benefits of modest omega-3 intake, from fish oil or any source, on cardiovascular disease and other problems seem reasonably well-established (tho' much less so than supplement pushers and health nuts like to pretend), whereas MiFRA remains, even after this validation study, an hypothesis, and one that has only been validated in mice. Given my 'druthers, I'd rather see average (or even health-conscious but AL and only modestly physically active) people eating fish and/or popping fish oil and not worrying about this than gambling on it and investing a lot of brain power and effort in doing so. Third, taking an organism that is aging normally and slowing or even stopping just ONE mechanism of aging in an otherwise normally-aging organism ought not to have much effect on lifespan or overall age-related health, because all the other mechanisms are still proceeding mostly apace. Per contra, when you take an animal that has already been pushed out of its normal, adaptive homeostatic poise and has an induced, abnormal slow-aging metabolic state like CR or Ames dwarves, and then interfere with one of its mechanisms of slowed aging, you might expect more of a 'weakest link in the chain' effect. It's that, rather than a 'bonus' anti-aging effect, that most leads me to my dietary regimen of minimal-adequate, short-chain omega-3 and omega-6 plus high-MUFA intake. - a normal-to-low low-fat control diet (2% fat by weight of diet). There was no effect on lifespan. Interestingly, the high-fat diets (especially the salmon oil diet) led to significant additional weight gain, which you might have expected to have shortened their lives; perhaps the anti-inflammatory effects of all that fish oil blunted the metabolic sequelae, as has been observed in some other, short-term rodent studies. (3-6) compared a high-MUFA, normal-fat diet vs. a high-sunflower oil normal-fat diet (with equivalent ALA level) (3-6), which latter is pretty similar t standard rodent chow, with only a little less n3. Again, there was no effect on LS, despite the fact that the MUFA diet lowered mtDNA deletions in both the brain (3) and the liver (4) as well as exerting a range of other favorable-looking effects on age-related oxidative stress parameters(3-6). However, more recently, Spindler's group reported that — in a normal-total-fat diet with the experimental oils substituted for some of the soybean oil — Lovaza/Omacor (highly purified EPA/DHA fish oil) at a dose scaled to human pharmacological use (4 g/day -- which is similar to doses many megadose supplement users, quite unreasonably, take for primary prevention) or krill oil at a dose taken from the animal studies that have reported positive-looking effects in short-term and/or highly artificial stress and disease models, may have shortened LS in their mice. I'm inclined to take Spindler's data more seriously, both because of his prior track record of careful work, (NB that Spindler carefully controlled for the animals' weight, unlike the others), and because (surprise!) his animals were all significantly longer-lived than all of the animals, implying that less-than-optimal husbandry may have played a role in the other studies (though I hasten to add that whereas the Spanish MUFA scientists (3-6)'s animals were clearly quite short-lived (from the survival curve — no $#*$%***!! quantitative data given), Valencak's animals appear to have been only very modestly so, from mean LS and the survival curve). It's also a bit hard to compare the diets used amongst these studies because of different and rather complicated reporting, but it looks as if Spindler's Lovaza-fed animals got almost the same absolute amounts of EPA+DHA as Valencak's salmon oil-fed animals. (2) Lovaza is almost 100% EPA+DHA, and was substituted for 11% of the total 4% fat, so that's 0.44% of chow by weight. Valencak's animals got much more total fat (11%), adn they seem to indicate that said fat was in the final formulation 4.9% EPA, 8% DHA, and 3.4% DPA of the total fat, which means that n3 HUFA composed (.049 + .08 + .034) x 11% = 1.8% of the total weight of diet — ie, less than half of what Spindler's mice got, and which (scaled up) would be equivalent to 2 g of n3 HUFA based on Spindler's allometric calculations. So maybe it's just a dose effect. To alert readers: sometime in the next few days, I'm going to add some updates into the body of the opening post in this thread; I will highlight these by shading them in red. 1: Spindler SR, Mote PL, Flegal JM. Dietary supplementation with Lovaza and krill oil shortens the life span of long-lived F1 mice. Age (Dordr). 2014 Jun;36(3):9659. doi: 10.1007/s11357-014-9659-7. Epub 2014 May 10. PubMed PMID: 24816553; PubMed Central PMCID: PMC4082564. 2: Valencak TG, Ruf T. Feeding into old age: long-term effects of dietary fatty acid supplementation on tissue composition and life span in mice. J Comp Physiol B. 2011 Feb;181(2):289-98. doi: 10.1007/s00360-010-0520-8. Epub 2010 Oct 28. PubMed PMID: 20981551; PubMed Central PMCID: PMC3022160. 3: Ochoa JJ, Pamplona R, Ramirez-Tortosa MC, Granados-Principal S, Perez-Lopez P, Naudí A, Portero-Otin M, López-Frías M, Battino M, Quiles JL. Age-related changes in brain mitochondrial DNA deletion and oxidative stress are differentially modulated by dietary fat type and coenzyme Q₁₀. Free Radic Biol Med. 2011 May 1;50(9):1053-64. doi: 10.1016/j.freeradbiomed.2011.02.004. Epub 2011 Feb 16. PubMed PMID: 21335087. 4: Quiles JL, Ochoa JJ, Ramirez-Tortosa MC, Huertas JR, Mataix J. Age-related mitochondrial DNA deletion in rat liver depends on dietary fat unsaturation. J Gerontol A Biol Sci Med Sci. 2006 Feb;61(2):107-14. PubMed PMID: 16510854. 5: Quiles JL, Ochoa JJ, Ramirez-Tortosa C, Battino M, Huertas JR, Martín Y, Mataix J. Dietary fat type (virgin olive vs. sunflower oils) affects age-related changes in DNA double-strand-breaks, antioxidant capacity and blood lipids in rats. Exp Gerontol. 2004 Aug;39(8):1189-98. PubMed PMID: 15288693. 6: Ochoa JJ, Quiles JL, Ibáñez S, Martínez E, López-Frías M, Huertas JR, Mataix J. Aging-related oxidative stress depends on dietary lipid source in rat postmitotic tissues. J Bioenerg Biomembr. 2003 Jun;35(3):267-75. PubMed PMID: 13678277. Spindler's paper on Lovaza and krill oil reports that EPA/DHA reduces lifespan in non-CR'ed healthy animals. Recent evidence in humans has thrown doubt on the benefits of fish oil, and Spindler's paper itself remarks "evidence for their health benefits is equivocal." I know you have also commented in the past that ALA may be as good as EPA/DHA for the purported health benefits, and of course it is an EFA anyway. Given these points, to me it would seem reasonable for every life-extensionist, including ad-libbers (unless individual- specific pathologies/risk factors indicate otherwise), to avoid EPA and DHA, and instead make sure to get sufficient ALA. I agree that the hypothesis is shaping up nicely, I would just like to add some nuance here and there. First of all, I believe that lipid composition either is or is not involved in aging, be it aging of ad libitum or CR-animals; it must be a general mechanism. And, it follows, that in principle it must be testable and provable in the ad lib state, even if this is more difficult than for CR animals. Comparative differences between species provide a powerful source of information that may inform our understanding of the aging process. However, two problems regularly attend such analyses. The co-variation of traits with body mass is frequently ignored, along with the lack of independence of the data due to a shared phylogenetic history. Nonetheless, I'd certainly describe the correlative data as still controversial. Researchers in the field, Barja, Hulbert (presumably) and my colleague Valencak are sitting on swaths of data, which taken together might one day allow us to overcome these statistical problems. They just need to realize how important cooperation on a pooled analysis is. Lack of Experimental Validation: direct contradiction of the hypothesis? Barja and colleagues finally published their atenolol study, in which they used a long-lived black 6 x DBA/2n (F1) cross (n=86). Their hybrid mouse is unusually long-lived even by literature standards at 32 and 47 months for median and maximum LS. Broadly speaking, they show that the drug greatly reduces membrane peroxidation index (PI) and improves markers of health, but does not extend lifespan, contradicting the long-held belief - even by Barja himself - that low PI drives higher lifespans. Some less straight-forward explanations are provided by the authors (effect masking), but to some extent this sounds like post hoc goalpost shifting. Atenolol may lower heart rate and central aortic pressure (and thus cardiac output) endangering the already weakened aged heart and end-organ perfusion. To my knowledge, however, cardiovascular disease is rather uncommon in mice. Spindler, in a similar study, showed a modest increase in lifespan. He also raised the possibility of liver toxicity: "Both metoprolol and nebivolol approximately doubled the number of liver tumors..."
… taking an organism that is aging normally and slowing or even stopping just ONE mechanism of aging in an otherwise normally-aging organism ought not to have much effect on lifespan or overall age-related health, because all the other mechanisms are still proceeding mostly apace. Per contra, when you take an animal that has already been pushed out of its normal, adaptive homeostatic poise and has an induced, abnormal slow-aging metabolic state like CR or Ames dwarves, and then interfere with one of its mechanisms of slowed aging, you might expect more of a 'weakest link in the chain' effect. It's that, rather than a 'bonus' anti-aging effect, that most leads me to my dietary regimen of minimal-adequate, short-chain omega-3 and omega-6 plus high-MUFA intake. Only mitochondrial DHA content shows any associations with lifespan at all, and this is only true for muscle and not liver. Of course, it’s striking how well this fits our working hypothesis: “post-mitotic tissues accumulate mitochondrial deletions, that's where membrane generated ROS in close proximity to the mitochondrial genome would matter most“. It remains to be seen if this is more than idle speculation. It looks like studying liver samples just because they are easily accessible might have been quite foolish! *I say at first glance because there is no overlap between the references you give on this topic and the ones Valencak and Azzu used as per Table 2; what exactly is going on here? Your references are liver, their table is not clear on this point AND they claim liver showed no association(! ), this may require more reading than I have done so far. In principle, though I do not favor this hypothesis, the correlative data might be coincidental and not causal. The feeding studies could be artifactual due to giving unphysiologic amounts of n3 and/or n6 fatty acids that interfere with other aspects of physiology. 1. Correlations between physiology and lifespan--two widely ignored problems with comparative studies. Speakman JR. Aging Cell. 2005 Aug;4(4):167-75. Review. 2. Aging Cell. 2007 Feb;6(1):15-25. Epub 2006 Dec 5. N-3 polyunsaturated fatty acids impair lifespan but have no role for metabolism. 3. J Gerontol A Biol Sci Med Sci. 2014 Feb 12. [Epub ahead of print]Fibroblasts From Long-Lived Rodent Species Exclude Cadmium.Dostál L1, Kohler WM, Penner-Hahn JE, Miller RA, Fierke CA. 4. Lifelong treatment with atenolol decreases membrane fatty acid unsaturation and oxidative stress in heart and skeletal muscle mitochondria and improves immunity and behavior, without changing mice longevity. Gómez A, Sánchez-Roman I, Gomez J, Cruces J, Mate I, Lopez-Torres M, Naudi A, Portero-Otin M, Pamplona R, De la Fuente M, Barja G.
Aging Cell. 2014 Jun;13(3):551-60. doi: 10.1111/acel.12205. Epub 2014 Feb 26. 5. Longev Healthspan. 2014 Mar 3;3(1):3. doi: 10.1186/2046-2395-3-3. First, thank you for chiming in: as always, your comments are very valued, and it's good to have feedback from someone who (as others will not know) is following the science on this closely. For those of you who don't know, Kamil is an infrequent but invaluable poster on Imminst/Longecity, and has an excellent blog on biogerontology and age-related disease. [Rearranged by MR for clarity and to unify argument; Kamil, speak up if I've mangled something]. Let me offer two (or two and a half) reasons to not take this argument too terribly seriously. First, even if the (main?) evolutionary driver of the reduction in membrane desaturation index in larger animals were indeed the metabolic requirements of their body size, that wouldn't necessarily make the lifespan correlate spurious. As noted, larger species of animals tend (all things being equal) to have longer lifespans – a relationship that is opposite, interestingly, to different strains or breeds of animals within a species, and apparently individual organisms within a species. It's generally thought that the evolutionary driver of this increase in lifespan — the evolutioinary/teleological "why" — is that larger body size reduces vulnerability to extrinsic entirely via predation and exposure. Reduced extrinsic mortality then creates secondary selective pressure for longer lifespan, because the investment in repair and maintenance will be rewarded with greater lifespan (rather than being rendered a waste of investment of resources because of those extrinsic mortality sources), and longer lifespan (ceteris paribus) means more opportunities for successful reproduction. But that still leaves open the question of the mechanistic basis of that greater lifespan, once selection is "looking" for longer lifespan — the evolutionary "how." It's entirely plausible that the original (main? exclusive?) evolutionary driver of the reduction in membrane desaturation index in larger animals could be the metabolic requirements of their body size, but that the same reduction in desaturation index then enables (in part) the increase in lifespan "for free." Cf. Dr. Aubrey de Grey's pleistic pleiotropy proposal, which argues that the powerful selective pressure to protect against the very life-threatening threat of cancer drives the evolution of DNA maintenance and repair machinery that is "luxuriously" sufficient to make non-cancer mutations not a limiting factor in lifespan, nor likely to limit a significant further increase therein once cancer is conquered. Non-exclusively, it's also possible that the secondary selection for increased lifespan in larger organisms provides additional selection for lower desaturation index, and the observed mass-desaturation index relationship is actually the product of the two sources of selective pressure (metabolic requirements and pressure to increase lifespan) jointly and consistently operating on membrane desaturation across species. 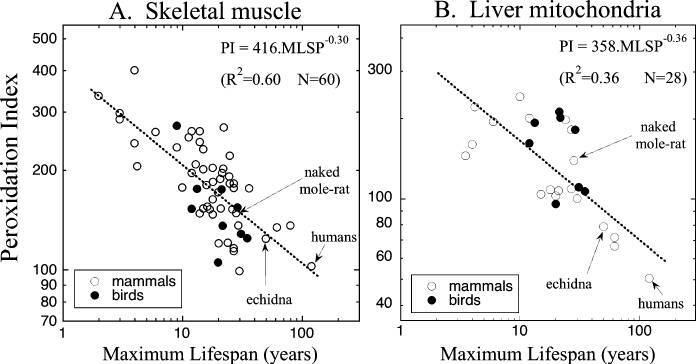 I think these three cases (naked mole-rats, echidnas, and H. sapiens) are rather notable exceptions to the rule, arguing that the desaturation index-lifespan connection is not only the product of body mass. However, that is only one exemplar, in only one tissue — and it's tissue cell membranes, not mitochondrial. But even if bats' exceptional longevity for body size did not a further reduction (relative to the normal trend for body mass) in membrane desat. index, that still wouldn't be a disproof: it would just mean that they had evolved alternative anti-aging mechanisms. A 2012 update moderated this negative view somewhat and highlighted some nuance, but still concluded "Initiating treatment of hypertension with beta-blockers leads to modest reductions in cardiovascular disease and no significant effects on mortality. These effects of beta-blockers are inferior to those of other antihypertensive drugs." ß-Blocker administration remains a standard of care in patients with angina pectoris, those who have had an MI, and those who have [left ventricular] dysfunction with or without [heart failure (HF)] symptoms, unless contraindicated. The ß-blockers carvedilol, metoprolol, and bisoprolol have been shown to improve outcomes in patients with HF. However, in patients who do not have symptomatic [coronary artery disease], have not had an MI, or do not have HF, the evidence for ß-blocker cardioprotection is weak, especially in the elderly, and there are other studies that suggest a relative lack of benefit on cerebrovascular and renal disease end points. You then look at their flowchart for classification, progression, and therapy of heart failure, and for patients who don't yet have it but are at risk because of diabetes, hypertension, and other risk factors only (Stage A) they only recommend treatment of hypertension with ACE inhibitors or angiotensin-receptor blockers (ARBs). Even at stage B ("structural heart disease but without signs or symptoms of HF") they still primarily recommend ACE inhibitors or angiotensin-receptor blockers (ARBs), only endorsing beta-blockers for "appropriate patients": "patients self-described as African Americans, with NYHA functional class III or IV [heart failure]. " ... specifically states that "The literature reveals that there is no benefit in using beta-blockers to treat essential hypertension. ... Patients with hypertension should not be given beta-blockers as primary treatment." When you have an effective class of antihypertensive that does not reduce CHD or mortality even in hypertensive humans without existing heart failre, it's reasonable to conclude that the benefits of lowered BP are being countermanded by other causes of death powerful enough to overcome the obvious, direct benefit of lowering BP. Giving such a drug, lifelong, to an animal that doesn't even have hypertension when the study begins, and who isn't at risk for atherosclerotic CVD, seems likely a good way to kill it, even if you slightly slow down aging in the process (as some of Barja's mice's health outcomes might seem to imply that it did). Atenolol may lower heart rate and central aortic pressure (and thus cardiac output) endangering the already weakened aged heart and end-organ perfusion. To my knowledge, however, cardiovascular disease is rather uncommon in mice. Cardiovascular disease in the sense that we usually mean it (atherosclerosis and its sequelae) is essentially nonexistant in WT mice, as you say. However, there is plenty of broadly of pathology in the aging mouse heart, including cardiomyopathy, cardiac hypertrophy, loss of diastolic function, and interstitial fibrosis (see eg. (8,9) So there's plenty of room for atenolol to do off-target help or harm. And even if WT, undrugged mice did not suffer any "natural," aging-driven cardiovascular pathology, that wouldn't mean that they would be immune from drug-induced cardiovascular pathology. All kinds of rodent disease models are created exactly by giving the animals harmful substances. I've been noting that the strongest associations are for DHA in particular from the very beginning, which makes sense because it's the most HUFA of HUFAs. The liver is not a good organ in which to test the hypothesis, because its cells are replicative and thus don't tend to accumulate mitochondrial deletion mutations (if the is connection between desaturation index to lifespan runs through this mechanism) and for the same reason it isn't quite as harmful when they do. It can thus be an indirect and perhaps loose proxy, but muscle tissue (and, again, muscle mitochondria ) is the best place to look. Brain is also a somewhat weak organ, simply because the level of DHA is more strictly regulated than in other tissues. 6. Hulbert AJ, Beard LA, Grigg GC. The exceptional longevity of an egg-laying mammal, the short-beaked echidna (Tachyglossus aculeatus) is associated with peroxidation-resistant membrane composition. Exp Gerontol. 2008 Aug;43(8):729-33. doi: 10.1016/j.exger.2008.05.015. Epub 2008 Jun 11. PubMed PMID: 18586080. 7: Wiysonge CS, Bradley H, Mayosi BM, Maroney R, Mbewu A, Opie LH, Volmink J. Beta-blockers for hypertension. Cochrane Database Syst Rev. 2007 Jan 24;(1):CD002003. Review. Update in: Cochrane Database Syst Rev. 2012;8:CD002003. PubMed PMID: 17253471. 8: Dhahbi JM, Tsuchiya T, Kim HJ, Mote PL, Spindler SR. Gene expression and physiologic responses of the heart to the initiation and withdrawal of caloric restriction. J Gerontol A Biol Sci Med Sci. 2006 Mar;61(3):218-31. PubMed PMID: 16567370. 9: Weiss EP, Fontana L. Caloric restriction: powerful protection for the aging heart and vasculature. Am J Physiol Heart Circ Physiol. 2011 Oct;301(4):H1205-19. doi: 10.1152/ajpheart.00685.2011. Epub 2011 Aug 12. PubMed PMID: 21841020; PubMed Central PMCID: PMC3197347. In your model of things, how will we replenish DHA in the brain if we don't eat any Omega-3 at all? * Just for your information, the best source for monounsaturated fat is macadamia oil, which is commercially available. Olive oil, while decent, still has plenty of Omega-6 fatty acid. I loved your discussion of the stability of monounsaturated. * I am not understanding the details on how phospholipids bind to fatty acids. Your discussion - and others I have seen - make it sound like phosphatidylcholine (PC) and PE have a preference to bind to HUFA. Let's assume we go with the suggestion of many biochemists to get Omega-3 and Omega-6 to under 2% of calories. What are PC and PE going to bind to now? We took all of the HUFA out of the diet, but we still need to maintain our cell membranes, and you are suggesting a key constituent of those membranes only binds to HUFA on at least one of its tails. What you seem to be saying at places is that Oleic - a monounsaturated fat - can occupy the positions in PC and PE that polyunsaturated occupy. I would love to see you make this more explicit and expand on this in great detail. Because I think this is the "money point" of your piece. I don't believe that Oleic can do that in neurons, but wow if you found some animal studies where they took out Omega-3 in all forms, inserted monounsaturated, and the animals did not suffer intellectual declines, that would be a fantastic find and should be incorporated into your presentation. * Do you have any opinion about supplementing the pure phospholipids with all of the fats extracted out? This is what BodyBio sells as "PC". I've tried it and feel remarkably better on it. I noticed immediate additional sense of well being and clarity when taking it. The phosphatidylcholine is said to be energetic so that might be what I react to. * I have always agreed with the point you make on rodents: the ones that live 20+ years have much much lower polyfat levels in their tissues compared to mice and rats. I think that does explain their short lifespans. But acknowledging that DHA levels of 25%+ in tissues is a death sentence is NOT the same as saying we should get 0% DHA. The truth is we don't need a lot, but we appear to need some, and the tough question is what is the minimum amount we must have for optimal brain health? * The thesis that saturated fat causes heart disease is falling out of favor. The earlier research on this failed to control for sugar in the diet. The newer research - particularly the better research where they control diet tightly by putting study participants in a hospital setting - is showing that it is high carbohydrate/sugar diets that produce bad lipid profiles, not saturated fat diets. I get about 50% of calories from saturated fats, mostly coconut milk. In spite of extensive heart disease in both trees of my family, EBT scanning shows I do not have a single calcification in my arterial system near the heart. Remember saturated fat has many different fatty acid compositions. Some of those profiles like chocolate/cacao and coconut milk are much more heart healthy than things like dairy cream. Dairy cream sent my lipid numbers through the roof. Cacao and coconut milk keep them very reasonable. And, as an aside, if you want to avoid calcifications what you need to do is focus on your nitric oxide levels, which decline for people above 40. It's failure of the nitric oxide system that damages the endothelial lining and starts the process of calcification. We all have more than enough LDL in us to patch an injured artery. You'll get more benefit from keeping nitric oxide at healthy levels than in obsessing over LDL. The hypothesis that eating fish oil with DHA leads to shorter human lifespan because it seems to be the case in calorie restriced rodents is not necessarily as sound as the rodent studies showing CR extends lifespan. Studies have shown that the conversion rate of ALA into DHA are small in humans. Women eating extra ALA fail to show increased DHA levels in breast milk. ALA is likely to be burnt, as studies have shown its relative potency in activating PPAR alpha, and their being so little stored in various sites in the body. The human body not only needs PUFAs for the brain. It's immune system and reproductive systems need arachidonic acid (AA) or eicosapentenoic acid (EPA) to make eicosanoids. EPA eicosanoids are known to be less inflammatory than AA equvalents, so health span and possibly lifespan can be extended from small to moderate EPA intake due to slower cell turnover due to inflammatory damage. Although omega 6 oils may be less prone to peroxidation, diets high in them (especially AA) are associated with obesity, inflammatory problems and raised cancer risk. Consider reading about the Israeli Paradox. EPA / DHA, due to their high peroxidability, have the ability to function as an antioxidant, and are often coupled with an antioxidant ethanolamine to help protect it in human phospholipids. Fish oil has been shown to have anti diabetic and anti atherosclerotic effects. Adequate dietary long chain omega 3 FAs may also be needed to maintain healthy blood vessel flexability over the human lifespan. High omega 3 / 6 ratios have been associated with people with the longest lifespan. The Japanese are known to be high fish consumers. Although, it can be conceded that Inuits, living on high fish fat diets, aren't known for lifespan records. The point on the brain needing some DHA to maintain and grow is also relevant. The results of the CR-different oil in rodent study seems sound in some ways. Making concentrated fish oil a large part of your calorie intake may be unwise and unnecessary. However, saying 'don't eat DHA' [at all], looking at the whole picture for humans, may be going too far. There are benefits with DHA fish oil. For optimum lifespan, health span and functioning, it may be a matter of meeting the bodies needs, much like vitamins. AFAIK, these are not counterpoints to what's on offer here. You should read through the first post (including links). [P]roinflammatory signaling was increased in the CR-Fish versus other CR groups [i.e. peroxisomal fatty acid β-oxidation genes than the other CR diet groups. So Michael's theory about the possible negative effects of the highly-unsaturated fat DHA for CR practitioners receives some additional support. I will note though (as others have noted earlier in this thread) that these mice were eating a lot of fish oil - nearly 10% of their calories. This is the 2000kcal human diet equivalent of about 22 grams of DHA/EPA per day - or about 10 servings of Atlantic salmon, the fish with the highest level of EPA/DHA. So it seems a little unfair to extrapolate these results to more reasonable levels of fish & fish oil consumption. induced by long-term calorie restriction. Taylor SL(3), Villalba JM(4), López-Lluch G(5), Navas P(5), Ramsey JJ(6). diets high in fish oil. [T]he mice on the three CR diets [lard, soybean-oil or fish-oil - DP] would be expected to have differences in mitochondrial membrane phospholipid composition which would impact life span if membrane fatty acid composition is a primary determinant of aging. The membrane theory of aging focuses on lipid peroxidation as the mechanism through which fatty acids influence life span. Consistent with this theory, the CR lard group had the lowest liver phospholipid peroxidizability index and the longest life span. However, the study did not provide overall support for the idea that membrane phospholipid fatty acid peroxidizability is the predominant mechanism through which dietary fatty acids influence lifespan. In particular, the CR soybean oil and CR fish oil groups had similar life spans despite the fact that peroxidizability index was significantly higher in liver and skeletal muscle mitochondria from the CR fish oil animals. 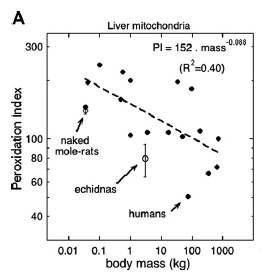 Similarly, it has been reported that life span was not different between ad libitum fed C57BL/6J mice consuming diets with either fish oil or sunflower oil (high in n-6 fatty acids) as the primary lipid source, despite the fact that peroxidizability index was significantly increased in liver and heart phospholipids from the mice consuming fish oil (36). Taken together, the results of these studies indicate that dietary fatty acids do not modulate lifespan in mice primarily by changing membrane composition to decrease susceptibility to peroxidation. That seems like a rather strong statement of dissent regarding your DHA-Accelerated Aging Hypothesis, from the very same study which you interpret as the best evidence in favor of the theory. What am I missing? As you can see, for the all-important post-mitotic skeletal muscles, only the fish-oil group had a significantly different (higher) peroxidizability index relative to controls. The mitochondrial membranes of the high-SFA/MUFA CR-lard group wasn't significantly lower than the high-PUFA soybean oil group (or controls) and yet they lived a bit longer. And the muscle MM of the CR-fish oil group was a lot more peroxidizability than the soybean oil (and lard) group, but the fish-oil CR group didn't live any shorter lives. The fact that the skeletal muscle peroxidizability index of the control mice fed nearly ad lib was not significantly higher than mice fed the same (soybeans oil based) diet but 40% restricted, yet the restricted mice live significantly longer than controls, would also seem to speak against skeletal muscle MM peroxidizability as a critical factor determining CR benefits as well. So on the surface of it anyway, the authors' skepticism of the "membrane pacemaker hypothesis", AKA the DHA-accelerated Aging Hypothesis, seems to be legitimate; the theory appears undermined, rather than bolstered, by the important details of their study. Of course, Michael indicated that the data was weak. (AARGH ... Lost my almost-completed post ... Dean, what do YOU do to preserve the formatting of Tables taken from other sources while still being able to save drafts along the way??). the DHA-Accelerated Aging Hypothesis... posits that people on CR should avoid intake of long-chain polyunsaturated fatty acids (LCPUFA), AKA highly-unsaturated fatty acids (HUFA), and especially omega-3 HUFA (DHA and EPA...), and especially-especially DHA. This is based on a range of empirical observations which are reviewed at the bottom of this post, and also in the introduction to material recently posted by Al Pater (see also (2) below, although it is from 2007 and comes at the subject from a different theoretical POV than I favor). The key point here is that the basic correlational data on mt membrane composition and species LS is there, as is the experimental data from animals on CR or with longevity mutations (and the weaker data from human centenarians): it's that on which the core DHA-accelerated aging hypothesis is built, from which the dietary guidelines I've outlined flow, and which this study has validated. The connection between this trend in longevity and the slower metabolic rate of large compared with small mammals identified aerobic metabolism as being central for understanding what determines a species life span. This centrality was initially expressed in the rate-of-living theory [my emphasis — please do NOT equate ROL theory with MiFRA or the membrane-pacemaker hypothesis! -MR] that, in turn, led to the development of the free-radical theory and consequently the oxidative-stress theory of aging, which is currently the most accepted explanation of aging. We do not suggest that the rate-of-living theory and the membrane-pacemaker modification of the oxidative-stress theory described here are incompatible. Rather, we suggest that the rate-of-living theory cannot alone explain all of the variation in longevity of animals. However, many of the exceptions that cannot be explained by the rate-of-living theory (and are summarized in sect. i) do appear capable of explanation by knowledge of membrane fatty acid composition in each particular case. Ultimately, however, it doesn't matter into what theoretical framework one incorporates these data (unless, of course, that framework posits that the effect correlation of mt membrane composition with species max LS, as well as the parallel effects of CR and longevity mutations, and the limited findings in centenarians is entirely outside of the causal chain linking the genetics and the interventions to lifespan — a position whch the paper we're discussing makes a lot harder to rationalize). What matters are the empirical findings themselves. CR itself is a black box, and it is Damned Foolish to pursue or neglect interventions purely on the basis of a notion of what links the independent to the dependent variable. *Note: *Survival times (days) with approximate 95% confidence interval indicated in parenthesis. The relationships aren't linear, of course, both because no one thinks that mt membrane composition is the only thing governing CR-modified or genetically-regulated species LS (hence my repeated emphasis that these links and the dietary guidance that it suggests are likely irrelevant to AL people), and because CR itself intervenes between dietary fatty acid intake and subsequent mt membrane composition. And clearly, CR induced a very substantial effect on at least mean LS, even in the CR+FO cohort — tho' it is striking, granted that max LS is our best operational metric of intrinsic aging, that its effects on max LS are less clear due to a lot of scatter in the numbers. I always include tables as captured PNG images (using a screen capture tool) and inserted via imgur.com, as described here. Here is how to recover a lost post you've been in the midst of composing. To backup posts while I'm composing them (e.g. if my computer reboots overnight), I cut-and-paste the rich-text into a gmail message and email it to myself. But I somehow have the feeling you're not a big fan of gmail☺. Regarding the meat of your post. I'm not sure I completely understand, so correct me if I'm misinterpreting. But it appears that your explanation for the fact that the longevity of the fish-oil fed CR mice was only modestly shorter than the lard-fed CR group, and statistically identical to the soy-fed CR group, despite having a much more peroxidizable, and therefore (by your theory) damage-prone, mitochondrial membrane is that the "relationship is not linear" and that CR's benefits aren't only a result of reducing membrane peroxidizability. The second part I get and agree with. But the non-linearity claim seems like a red herring. In particular, you say it's non-linear because "CR itself intervenes between dietary fatty acid intake and subsequent mt membrane composition." But your post and mine show the study's actual measured data on membrane peroxidizability (i.e. after the "CR intervention" on membrane composition), and the fish-oil group's skeletal muscle MT membranes were 40% more peroxidizable than the lard group and 30% more peroxidizable than the soy group. That seems like a really big boost in peroxidizability with little associated impact on longevity, particularly relative to the soy group, which enjoyed only 3.6% max lifespan advantage over the fish-oil group. In short, the DHA-accelerated Aging Hypothesis appears to be a minor player at most when it comes to CR benefits, particularly when you consider just how much DHA the fish-oil group was eating - the human equivalent of 10 servings of Atlantic salmon per day. Put another way, if the equivalent of 10 servings of salmon per day shortens lifespan by less than 4%, how much damage can 1-2 serving of fish per week really be expected to do per your hypothesis? Do you think your warning that CR folks should avoid dietary DHA like the plague is really justified based on these results? Here is another paper  (that Al found - thanks Al!) that did the same thing as the paper Michael opened this thread with - namely feed mature rats mice1 either AL-soy-oil, CR-Lard, CR-Soy-oil or CR-Fish-oil. The fats were about 16% of the total calories in the diet - so that was a lot of fish oil. It wasn't a lifespan study. Instead they fed the mice the four diets for either 6 or 18 months, and sacrificed them to look at their liver cells, and in particular their liver mitochondria. There were a multitude of minor differences in mitochondrial morphology - bigger, denser mitochondria across the CR conditions relative to AL, but pretty similar to each other. See the full text for the subtle differences that were observed between diet groups. To my eye, where things were different between the different CR diets, the differences seem modest and all over the map, as far as I could tell. susceptible to peroxidation and oxidative stress. Obviously it's speculation, but such a protective effect against peroxidation might explain why loading CRed rodents with the equivalent 10 fatty fish meals worth of DHA per day had only a very modest impact on lifespan, as discussed above. 1 Tom corrected my mistake - see below. I initially said rats in connection with study , where the study was actually in mice. aged, calorie restricted mice fed with different dietary fats. Sensitivity of primary fibroblasts in culture to atmospheric oxygen does not correlate with species lifespan. Patrick A1, Seluanov M1, Hwang C1, Tam J1, Khan T1, Morgenstern A1, Wiener L1, Vazquez JM1, Zafar H1, Wen R1, Muratkalyeva M1, Doerig K1, Zagorulya M1, Cole L1, Catalano S1, Ladd AA2, Coppi AA3, Coşkun Y4, Tian X1, Ablaeva J1, Nevo E5, Gladyshev VN6, Zhang ZD7, Vijg J7, Seluanov A1, Gorbunova V1. Differences in the way human and mouse fibroblasts experience senescence in culture had long puzzled researchers. While senescence of human cells is mediated by telomere shortening, Parrinello et al. demonstrated that senescence of mouse cells is caused by extreme oxygen sensitivity. It was hypothesized that the striking difference in oxygen sensitivity between mouse and human cells explains their different rates of aging. To test if this hypothesis is broadly applicable, we cultured cells from 16 rodent species with diverse lifespans in 3% and 21% oxygen and compared their growth rates. Unexpectedly, fibroblasts derived from laboratory mouse strains were the only cells demonstrating extreme sensitivity to oxygen. Cells from hamster, muskrat, woodchuck, capybara, blind mole rat, paca, squirrel, beaver, naked mole rat and wild-caught mice were mildly sensitive to oxygen, while cells from rat, gerbil, deer mouse, chipmunk, guinea pig and chinchilla showed no difference in the growth rate between 3% and 21% oxygen. We conclude that, although the growth of primary fibroblasts is generally improved by maintaining cells in 3% oxygen, the extreme oxygen sensitivity is a peculiarity of laboratory mouse strains, possibly related to their very long telomeres, and fibroblast oxygen sensitivity does not directly correlate with species' lifespan. Oops. Good catch Tom. Sorry about that. I've corrected my error. Interesting that lab mice are such a standout from other rodents when it comes to hypoxia sensitivity. Biochim Biophys Acta. 2009 May;1787(5):437-61. doi: 10.1016/j.bbabio.2008.12.008. Epub 2008 Dec 29. Skulachev VP1, Anisimov VN, Antonenko YN, Bakeeva LE, Chernyak BV, Erichev VP, Filenko OF, Kalinina NI, Kapelko VI, Kolosova NG, Kopnin BP,Korshunova GA, Lichinitser MR, Obukhova LA, Pasyukova EG, Pisarenko OI, Roginsky VA, Ruuge EK, Senin II, Severina II, Skulachev MV, Spivak IM,Tashlitsky VN, Tkachuk VA, Vyssokikh MY, Yaguzhinsky LS, Zorov DB. C57BL/6 mice are not among "cherry-picked mouse strains". CRed mice are not rodent fibroblasts. In vitro fibrblasts, as you admit they are, are not mice. All the rodent species in the paper you present live in the same atmospheric oxygen levels, but have different lifespans. The atmospheres that the fibroblasts are cultured in do not relate to hydroperoxides in mitochondria of live CRed mice. The evidence clearly shows that CR + Lard > all. Logical conclusion --> increase lard consumption. But how much should we CR the pigs to achieve escape velocity?